WHAT IS THE INTERNATIONAL VOLUNTEER PROGRAM? Travel to West Africa, Nepal or Sri Lanka with Street Child International Volunteer Program and work with the local team to change lives. Placements go from 2 weeks to 12 weeks for students, graduates, retired professionals or anyone who just wants to leave the western world! Our International Volunteer Program gives you the opportunity to get acquainted with international development and to make an impact on the lives of the world's most vulnerable children. Learn more about our International Teacher Training program, in which you can use your skills and experience and make a real difference. WHAT'S YOUR MISSION AS AN INTERNATIONAL VOLUNTEER? During your volunteering with Street Child, you will work on development, an experience that will undoubtedly change your life. From supporting local teachers in Sierra Leone and Liberia, to research and school construction in Nepal or Sri Lanka, Street Child tries to link your skills to our projects and create the greatest impact. Our volunteer work is certainly not for everyone. The living conditions are probably much simpler than what you are used to. With little access to running water, internet and electricity, it is an experience that gives you a realistic picture of the country in which you work. Working with our local Street Child staff, you learn as much as you give, you get to know people you will never forget and you experience an adventure that will have a positive impact. Looking for a career in international development or want to experience a life-changing trip? Street Child is looking for dynamic, responsible and independent young people who want to grow on a professional and personal level, while being motivated to make a difference. You will work closely with our local teams and help them implement our projects. The diverse roles we offer include tasks such as teaching English, training staff in computer skills, helping organize our sportive events, collecting and analyzing data, helping with monitoring/evaluation and supporting research. Marina holds a Masters in International Security from the University of Groningen. In May she left for Sierra Leone for 3 months to undertake work for her thesis on the rehabilitation and integration process of former child soldiers recruited during the bloody civil war. Before this she did a six month internship at the Street Child office in Barcelona and with her extra knowledge about the projects, she also regularly helps the local team monitor local projects, and organise the Sierra Leone Marathon. Are you just retired, do you need a sabbatical, or do you want to develop your skills further? Street Child is looking for professionals who want to use their skills, so that we can do even more for the children and families with whom we work. You work side by side with our local team for a unique and unforgettable experience. The roles we offer include support and training of local teachers with our teacher training program, support our communication team from one of our project countries, and support our social enterprises with your knowledge from the business world. David participated in our teacher training program and contributed to the improvement of education in Sierra Leone. In his 17-day experience between Kamakwie, Kambia and Makeni, he saw and experienced the difficulties that local teachers experience on a daily basis: a very simple school building, no running water and a very limited knowledge. But what struck him the most was teachers' determination. Street Child helps the most disadvantaged children in West Africa, Nepal and Sri Lanka to go to school. We have set the goal to improve the lives of the most vulnerable children through education, with an extra focus on girls and emergency situations. 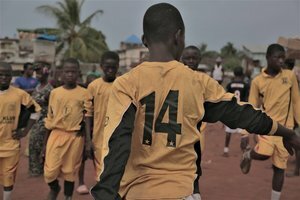 We started our work in Sierra Leone in 2008 with 100 street children, and to date we have transformed the lives of more than 100,000 children in Sierra Leone, Liberia and Nepal. In 2017 we started our work in Northern Nigeria in response to the world's worst humanitarian crisis: 3 million children cannot go to school and need urgent help. Through volunteering for Street Child, you will donate your time and expertise to give children hope for a better future through education. Street Child projects are carried out by exceptional local partners, whose dedicated work produces a significant and long lasting impact. 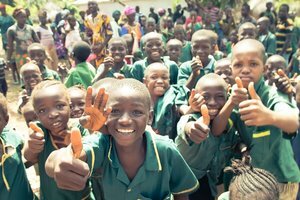 By volunteering with Street Child abroad, you help us to to create sustainable activities to change children lives. Sustainability: it is important that our volunteers contribute in a useful and meaningful way. Impact: During their placements, volunteers must strive to leave as large and long-lasting an impact as possible. Responsibility: From the practical preparation for the trip to the execution of the work at the location, volunteers are responsible for their own contribution and motivation. Modesty, cooperation and openness are the key to the best experience and make the biggest impact. We set all our volunteers the goal of fundraising €1200 for Street Child. Our projects are only possible because of the money we raise: it is an essential part of working in the non-profit sector, and gives every international volunteer a good idea of project financing. Our professional fundraising team has materials and information which can help you achieve this target. If you want more information regarding why we ask our volunteers to fundraise or have concerns about reaching our fundraising goal, please have a look at this article. Volunteers also pay a daily rate that varies between €6-12, which covers the costs for the accommodation, project-related transport costs and transport from/to the airport. You pay the flights, vaccinations (yellow fever vaccination is mandatory and you have to take malaria tablets), breakfast, dinner, travel insurance, visas and personal expenses. Want to know more about the costs? Email us at intvol-eu@street-child.co.uk. We advise you to discuss vaccinations with your doctor. In many cases, your vaccinations are fully or partially covered by your health insurance. So check with your insurance how much you can get reimbursed. HOW TO BECOME AN INTERNATIONAL VOLUNTEER? Street Child has international volunteers from all sorts of backgrounds including students, graduates and professionals; we are constantly looking for people who can fulfill a range of ever-changing needs in the workplace. We are selective about who gets a position on our program and only place volunteers whom we believe can actually contribute to our work. In this way, the volunteers get the most out of their time and they actually have an impact on our work. If your profile seems interesting to us, we will get in contact and invite promising candidates to a phone interview. Good luck!